Pretty poisons? Toxic tinsel? How to pet-proof your winter and holiday season? Mistletoe may be good for a smooch, but did you know it could hurt your pooch? And while your Christmas tree may envy the one in Rockefeller Center, it's just a cool scratching post to your cat. And is that really just a puddle of water your dog lapped up while you were waiting to cross the street, or was it antifreeze? Make sure this winter and holiday season is a healthy, happy and safe one for both you and your furry pal this year with these great tips from the American Society for the Prevention of Cruelty to Animals (ASPCA). Never let your dog off the leash on snow or ice, especially during a snowstorm. Dogs frequently lose their scent in snow and ice and can easily become lost. More dogs are lost in the winter than any other season, so make sure they always wear I.D. tags. Thoroughly wipe off your dog's legs and stomach when they come in out of the sleet, snow or ice. Salt, antifreeze or other chemicals could hurt your dog if ingested while licking their paws. If you have a shorthaired breed, consider getting a warm coat or sweater with a high collar or turtleneck for your dog. Look for one that covers the dog from the base of the tail on top to the belly underneath. While this may seem like a luxury, it is a necessity for many. Puppies do not tolerate the cold as well as adult dogs and may be difficult to housebreak during the winter. If your dog spends a lot of time engaged in outdoor activities, increase their supply of food, particularly protein, to keep their fur thick and healthy. If your dog is sensitive to the cold due to age, illness or breed type, take them outdoors only long enough to relieve themselves. Unless you walk your cat outside (and you may!) or let him come or go as he pleases, your housecat cat will generally do okay in the winter. However, there are a few important tips to keep in mind for your cat as well as others this winter. Keep your cats inside. 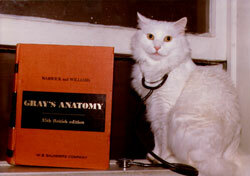 Outdoor cats can freeze, become lost or stolen, injured or killed. During the winter, outdoor cats sometimes sleep under the hoods of cars where it is warmer. If you have a car, and especially if you know there are stray cats in the area, bang loudly on the hood and wait a few seconds to give the cat a chance to escape. Antifreeze, even in very tiny doses is a lethal poison for dogs and cats. Unfortunately, because of its sweet taste, animals are attracted to it. It contains ethylene glycol, which can cause rapid and permanent kidney damage to your pet if he ingests even a very small amount. As little as one teaspoon can be deadly for an average size cat, who can ingest the chemical just by wandering through it and then cleaning his paws. And less than four teaspoons can be dangerous to a 10-lb. dog, who could lap antifreeze up from an unidentified puddle on the street. Although more drivers are using animal friendly products that contain propylene glycol rather than traditional products containing ethylene glycol, call your veterinarian or The ASPCA Animal Poison Control Center (1-888-4ANI-HELP) right away if you suspect your animal has ingested something poisonous. Make sure your pet has a warm place to sleep and is far away from drafts and off the floor. Consider a dog or cat bed or a basket with a warm blanket or pillow in it. Never leave your dog or cat alone in a car during the cold weather. A car can act as a refrigerator in the winter, holding in the cold and freezing your animal to death. You may think that last tub of marzipan paste you scored from the gourmet store is divine, but some holiday treats and decorations that are harmless to humans are a serious health risk to pets. Best bet? Lick your own fingers and buy fake versions of festive holiday flora. We won't tell. They may be pretty, but they are poisonous to your pets. Holiday plants like poinsettias, mistletoe, ivy, and holly berries can be dangerous, even fatal. Christmas and Hanukkah candles should be put in places where your pets can't over turn them and possibly set themselves--and your house--on fire. Yes, they're giving you "that face" as you sit down to your holiday feast, but think twice about sneaking the little beggar some scraps. Poultry bones can splinter and cause blockages, chocolates are poisonous, and any change of diet, even for one meal, can give a dog or cat severe indigestion and diarrhea. This is particularly true for older animals that have more delicate digestive systems and nutritional requirements. But if your pet is already used to eating leftovers, feed them meat without rich sauces or spices--even fresh vegetables are a good alternative. But never feed them candy or sugar. They can give your pet diarrhea or intestinal problems. Alcoholic beverages, chocolate, coffee grounds and espresso beans, moldy or spoiled food, onions, onion powder, salt and yeast dough should be off-limits items for cats and dogs. 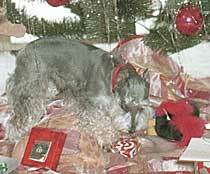 Christmas tree water may contain fertilizers, which, if ingested, can cause stomach upset. Stagnant tree water can also be a breeding ground for bacteria, which can lead to vomiting, nausea, or diarrhea. Make sure a tree skirt or a cloth covers the bottom of the Christmas tree. Some animals, especially kittens and puppies, like to chew on exposed wires. Unfortunately, this can electrocute your pet. Tape down loose wires to baseboards and hide wiring as much as possible. Go ahead--get your camera and let your dog or cat romp through the boxes and wrapping paper, but remove the bows and the yarn. Cut away shopping bag handles on bags, which small dogs and cats can easily choke on. And keep aluminum foil away from your animals, which can cause vomiting and intestinal blockage. Finally, keep in mind that crowds and holiday festivities frighten some animals. If your pet does not do well with crowds and loud noise, make sure you set aside a safe and quiet haven for him to chill out if necessary. If you are a cat owner, remember that cats are creatures of habit. Disruptions in the home during the holidays, such as rearranging the furniture, could cause your feline to stop using the litter box. While these tips are generally geared to dog owners, most will help keep kitty safe, too! The holidays are not ideal for introducing a pet into your family. New puppies and dogs require extra attention and a stable environment, which can be difficult during the holidays. Also, a puppy is not a toy or gift that can be returned. Instead, the AKC suggests giving a gift representative of the dog to come, such as a toy, or leash, or a bed. Like you would for a child, review holiday gifts to make sure they are safe before giving them to your dog. Groom your dog regularly. Your dog needs a well-groomed coat to keep properly insulated. Short or coarse-haired dogs may need a sweater or coat, and long-haired dogs should have excess hair around the toes and foot pads trimmed to ease snow removal and cleaning. Your dog can get frostbite, believe it or not. To prevent frostbite on ears, tails and feet, don't let your dog outdoors too long. Be careful of fireplaces and portable heaters. Both can severely burn your dog. Make sure all fireplaces have screens and keep portable heaters out of reach. Like people, dogs seem to be more susceptible to illness in winter. Take your dog to a veterinarian if you see any suspicious symptoms. Remove holiday lights from the lower branches of the tree. They may get very hot and burn curious noses. Skip the edible ornaments. Your dog may knock the tree over in an attempt to eat them. Also, commercial ornaments may contain paint or toxins in the preservatives. Whether live or artificial, pine needles are sharp and indigestible. Don't leave your dog unattended in the room with the tree. Tinsel is dangerous for dogs! It may obstruct circulation and, if swallowed, block the intestines.